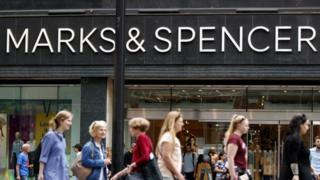 Marks & Spencer has seen its sales drop over the Christmas holiday period. Like-for-like sales, which strip out the impact of new stores, were down 2.2% in the 13 weeks to 29 December. Chief executive Steve Rowe said the combination of reducing consumer confidence, mild weather, Black Friday, and widespread discounting by competitors had made November “a very challenging trading period”. He said the clothing and home department was in the “early stages of far reaching changes in range, in style, customer focus and channel mix”. He said the objective was to deliver market leading value and to focus on stylish and wearable items. Mr Rowe added that changes to the food offering were making “good progress”.